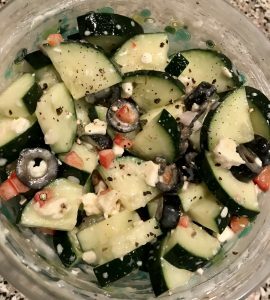 I very often pack my husband a cucumber salad for lunch, I usually keep it simple olive oil and vinegar, some seasoning, maybe a sprinkle of cheese, nothing too fancy. However since being on keto, he is hungry, anyone on this diet knows the hunger I’m talking about. When you cut out the carbs and your body is burning fat like crazy you get a little ravenous. I wanted to take the cucumber salad that he already knows and loves and punch it up a little bit. 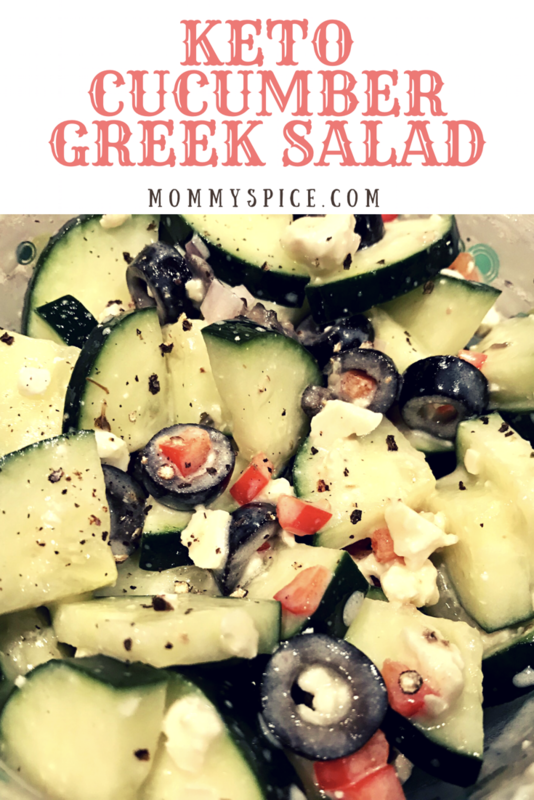 Our daughter loves when I make my greek pasta salad for her lunch, so I decided to take the same idea and make it keto friendly. First up, make your dressing. 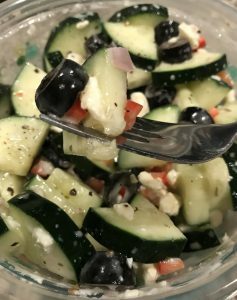 Combine pre-made Greek dressing (or make your own) with 2 tablespoons plain Greek yogurt, red onion and bell pepper, whisk to combine with a sprinkle of salt and black pepper. Dice your cucumber and place in a Tupperware container, pour dressing over cucumber and stir until covered. Next add in olives and feta. That’s it! Super easy. You can enjoy it right away or put the lid on your Tupperware and let it sit over night for a perfect easy to grab lunch in the morning. I really love pasta salads, I have ever since I was a kid. My Mom used to always make a big batch of pasta salad for us to take with us whenever we traveled for my dance completions. It was filling, comforting and just so delicious. 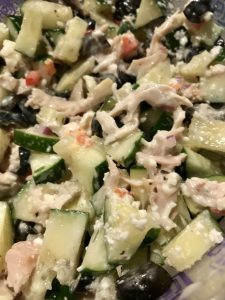 Well with keto you have to take the pasta out of a the pasta salad and the cucumber is a really good vessel for that. One thing I love about cucumbers is you can cut them in so many ways. Peel them, or leave the skin on, diced, rounds, rectangles, julienne strips, you name it. 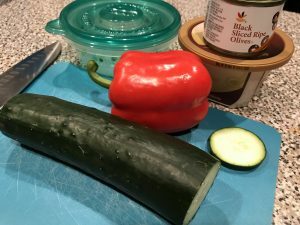 So my tip here is to cut your cucumber however you like, strips might give you more of a pasta feel if you’re trying to trick your brain a bit, or dice it the same size as your olives to keep the bites streamlined. For an extra Keto boost you can add in a 1/2 cup of cooked, chopped chicken. Makes it more filling without adding any carbs. Endless possibilities, but completely keto approved! Here it is with shredded chicken added in.